Before and during the primary, Balletto did not jump joyfully through Lamont’s campaign hoops. Like Joe Ganim, who tousled with Lamont during the Democrat primary, Balletto is a big city Democrat with a world of experience under his belt, a bit of a street fighter and good man in a narrow alley. The political roots of the decade long Chairman of the Democrat Party run through New Haven; Ganim is mayor of Bridgeport. On the eve of the Democrat primary vote, Balletto announced phlegmatically that he would support the victor of the primary, not an unusual posture for a party chairman. Wyman, Malloy’s “yes woman” during his two terms in office, has some experience dealing with a Democrat majority in the General Assembly. There are no visible thorns on her rose. A backroom omertà, lathered as usual in political jargon, was smeared over the proceedings. Before Balletto was tenderly dismissed, the crew had dinner together. In affairs of this kind, a dinner is essential, followed by the usual press availability in which all the associates are permitted to brandish their chest scars or swagger behind the new political boss into office. There are more Italians per square inch in Connecticut than can be found in any other state, but Lamont is not in office to play the usual political games – ethnically balanced tickets and the like. He was swept into office on a wave of discontent with the policies of the prior administration. When the present occupant leaves office, he will be gainfully employed in Massachusetts, a state people in Connecticut used to call, disparagingly, Taxachusetts. But that was before Malloy snatched the golden crown from Taxachusetts’ head. 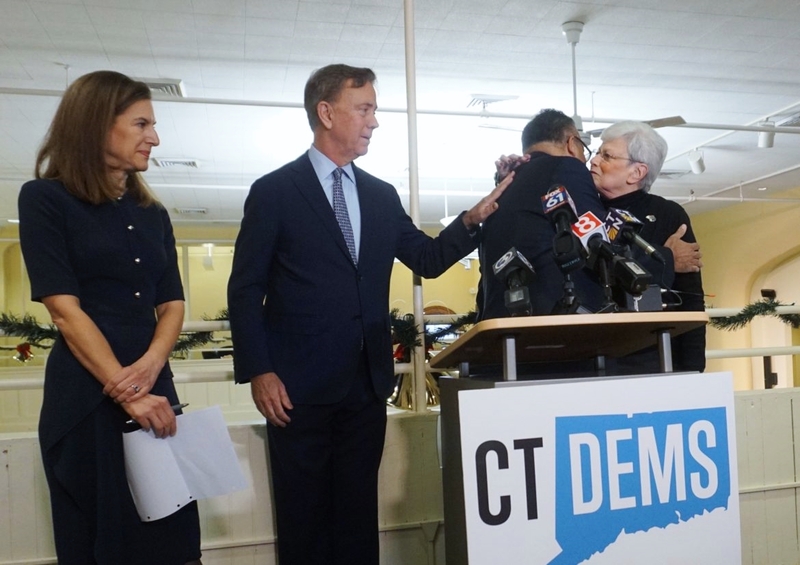 Thus far, Connecticut’s media, panting for more taxes, is in Lamont’s corner. The Governor-In-Waiting has massive majorities in the General Assembly, half of which are Ocasio-Cortez progressives. The feminist version of Ocasio-Cortez in Connecticut is U.S. Senator Chris Murphy. All the members of the U.S. Congressional Delegation and all the constitutional offices in Connecticut are held by progressive Democrats anxious to make the world over so that it resembles a cross between Switzerland and Venezuela, without Switzerland’s penchant for arming its citizens. Switzerland has one of the highest rates of gun ownership in the world, but little gun-related street crime, an embarrassment to senators like Blumenthal and Murphy, both of whom are afflicted with hoplophobia. In Connecticut, the highest taxed state in the nation, we are all quasi-socialists now. What could possibly go wrong?